This very tidy fan shroud is designed specifically for Jaguar XJ6 (70-87) and (76-96) XJS cars with Chevy V8 conversions (good for all carbureted, TPI, or TBI V8 installations- not required for LT1 and LS1/LSx conversions). 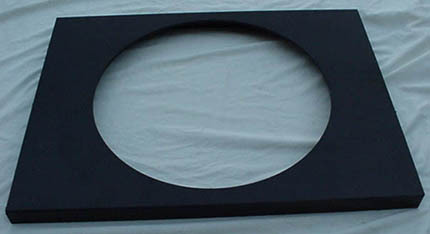 It comes ready to install with a precut center opening to mount the very powerful and inexpensive mid-80's/early 90's GM 17" Corvette, Camaro, and Firebird 17" electric fan. 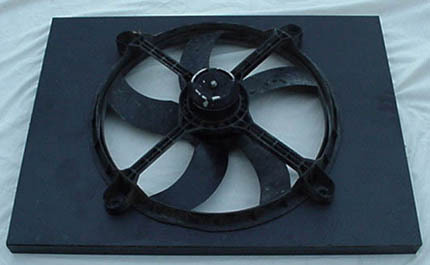 These fans are so powerful that the factory originally mounted them on Camaro and Trans Am cars without a shroud. With the somewhat more demanding cooling requirements of the Jaguar V8 installation, this new shroud fits the bill perfectly- this combination moves a lot of air!!!. It is constructed of sturdy ¼" ABS plastic with an attractive wrinkle finish, and its simple design allows for a variety of mounting options on the various Jag models. Several small angle brackets at the appropriate locations work best for mounting to the Jaguar radiator opening- (we usually use the original brackets that located the original Jaguar fan shroud). 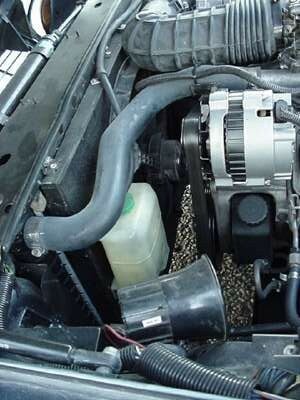 The shroud will work with conversions using the typical Camaro alum/plastic radiator, most 3 and 4-row brass radiators for this conversion, and even stock Jag radiators converted for V8 use. It looks great, works great, and saves loads of time as the quick final touch to the cooling system. Don't mess around with finicky, complicated aftermarket fan installations that often create additional problems without curing your cooling woes. This fan shroud and electric fan combo is all that is needed and will prevent overheating trouble in your conversion. GM and Chevrolet used these fans on several hundred thousand cars- they're ultra reliable, cheap, and plentiful (I see these on Ebay all the time for $25-$35). Can you say the same about that ultra expensive, super who-knows-what custom electric fan the speed shop sells??? The photos show the shroud bare, the shroud with the 17" electric fan fitted to it, and the fan/shroud combo mounted in my 89 XJS (look closely- it's in there).